One serving of this will get you through the afternoon grind, I can almost guarantee it. Healthy with enough crunch to satisfy even the non-granola persona, this dish can be made ahead for parties or for a week’s worth of lunches and sides. Bring 2.5 cups of water to a boil in a small pot. Add the bulgar. Bring to a simmer and cover. Cook for 40 minutes or until the bulgar has absorbed the liquid. Drain the bulgar. Using a grill pan drizzled with olive oil, grill the corn kernels until they have a nice brown grill mark. 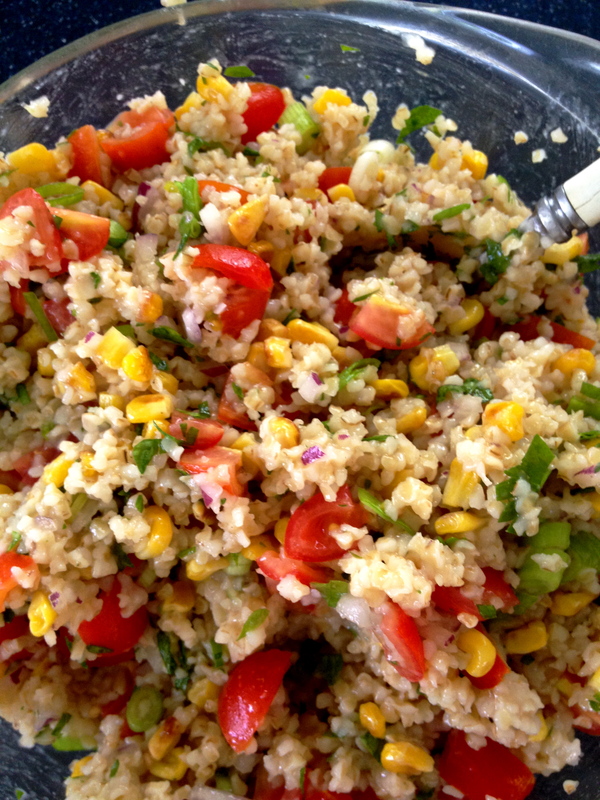 Combine the bulgar, corn, chopped parsley, halved tomatoes, diced red onion, chopped scallion, and mix. The flavors will give it a natural moisture. Squeeze lemon juice over it to taste. Sprinkle salt and pepper to taste. Give it a gentle mix. If you like, you can add a few drops of white wine vinegar or a drizzle of olive oil, but I find that this salad is often moist enough on its own without additional dressing. Hi Annalee, This looks delicious! I will make it this weekend. Love your blog…you are a marvelous chef, writer and Renaissance woman! Hi Annalee love reading your blog and have tried many of you reciepe delish!! You look wonderful and sound like you are enjoying everything life has to offer, so happy for you honey if you have get the opportunity to visit Newport please let us know Bill and I would love to see you!